Veikko has been striking deals, shifting capital and sniffing out investment opportunities in the Nordics, Eastern and Central Europe and the former Soviet Union ever since markets began to open in the early 1990s. Veikko gained his first experience back in 1992 from Estonian Credit Bank, a commercial bank oriented towards corporate banking, where he advised and supported companies that wanted to deal and conduct transactions with businesses in the East, particularly Ukraine, Belarus, Kazakhstan, and Russia. He joined Suprema Securities, a leading Baltic investment bank in 1997 with a brief to run international capital market sales, trading, and research, until Suprema’s (the leading stock exchange broker and investment bank in the Baltics) takeover by Evli in 2002 merged that function into the Finnish group. Veikko focused on building highly committed asset, fund management, private banking and institutional investment management business since then until 2008. In 2008, Veikko was one of the two founding senior partners behind the launch of a new investment and financial advisory company, Redgate Capital. He has been fully contributing to the business of Redgate until 2016, when the expansion plans led to spin-off into a new group, Head Capital, focusing solely on investments and helping them grow in a new environment. Veikko has been involved in capital markets, asset management, organizational management, and investments in a broad variety of sectors, companies and projects since 1992. He has been in charge of investment and pension funds, venture and private equity, management of companies, and research and capital market activities. 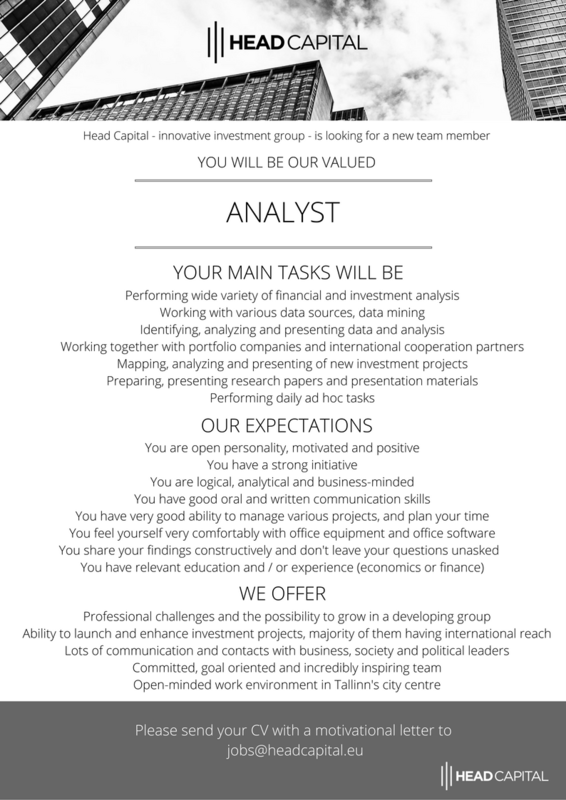 Head Capital is hiring and accepting applications for internship – positions are available in Tallinn and beyond. One of our missions is to employ the industry’s most talented professionals and promising young talents – Head Capital is constantly looking for professionals, leaders and ambitious young people to help us grow and best serve our investments. If you believe you have a unique edge to offer our clients and the firm, please contact us with the details below.